Chinese Firms Now Hold Stakes In Over A Dozen European Ports China's expansion into European ports is part of its new Maritime Silk Road, which aims to better connect the country to global commercial hubs. But this is about more than just moving cargo. The port of Piraeus has long been a metaphor for Greece, going back to when ancient Greek warriors set off to sea battles. Today, a Chinese company holds a controlling stake in the port. This port has long been a metaphor for Greece. It's where ancient warriors in triremes set off for battle and where refugees in fishing boats arrived in the early 20th century, fleeing the collapse of the Ottoman Empire. It's also where Hollywood docked to film the 1960 movie Never on Sunday. The film's Oscar-winning theme song is a love anthem to the port. 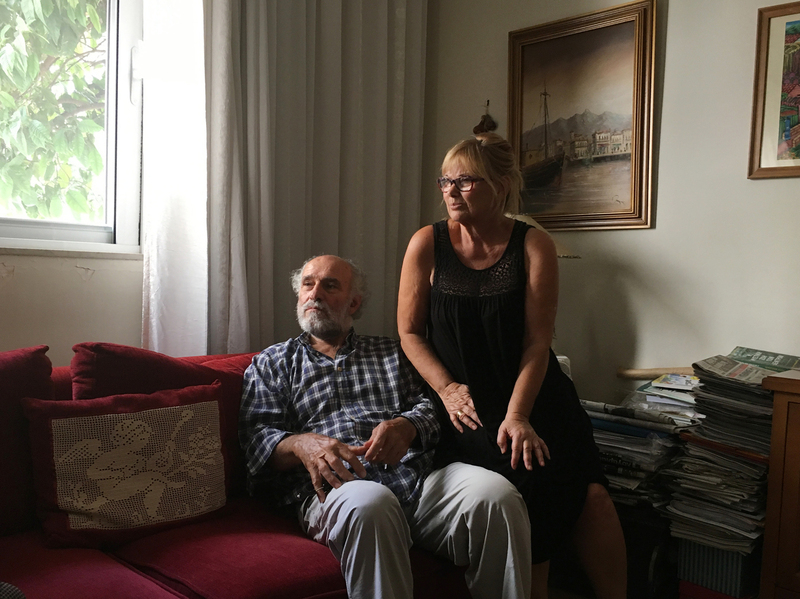 "It's a blessed location," says Nouchoutidis, 67, reminiscing in his living room, under a watercolor painting of a ship. "It's across from the Suez Canal. It's deep enough for big ships. And it's my home. My father worked here," he says. "We didn't have machines back then. We used to load everything onto the boats with our own hands — bags of clothes, leather goods and knitwear made in Greece, all bound for North America and Australia." But by the time Nouchoutidis retired, in 2010, the port was about to take on a new identity: China's main gateway to Europe. That's the year the state-owned China Ocean Shipping Co., known as COSCO, started buying stakes in the port of Piraeus. Six years later, the company controlled the port. Giorgos Nouchoutidis, shown at home with wife Maria, worked at the port of Piraeus for decades before retiring in 2010. "It's a huge mistake for our government — and for the European Union — to have given up this port to the Chinese," he says. "We handed over control of our most important port to a company that's not even in the European Union," Nouchoutidis says. "The EU pushed us to do it. ... They will see the damage to our interests in a few years." In the past decade, Chinese companies have acquired stakes in 13 ports in Europe, including in Greece, Spain and, most recently, Belgium, according to a study by the Organization for Economic Cooperation and Development. Those ports handle about 10 percent of Europe's shipping container capacity. It is part of China's 21st Century Maritime Silk Road, which aims to better connect the country to commercial hubs in Africa, Asia, Europe and Oceania. China is the European Union's biggest source of imports and its second-largest export market, adding up to more than $1 billion in trade per day. And sea shipping outweighs rail or air freight. But this is about more than just moving cargo, analysts say. President Xi Jinping's new silk road, named after the ancient trade route, has sped up China's advance toward becoming a superpower of the seas, spreading not just commercial ships but naval power and influence to more and more areas of the world. For instance, Chinese investments in the ports of Djibouti, Sri Lanka and Pakistan have been followed by Chinese naval deployments. While there are no public plans to turn European ports into Beijing's military bases, Chinese warships have already paid a friendly visit to Greece's Piraeus port. "The main issue is for Europe to decide how it wants to deal with China's influence," says Frans-Paul van der Putten, a China expert at the Netherlands Institute of International Relations. "What degree of China's influence is unavoidable and acceptable especially in sectors such as ports?" "Surround it and squeeze it"
In September 2017, European Commission President Jean-Claude Juncker proposed new investment screening measures for foreign state-owned companies that want "to purchase a European harbor, part of our energy infrastructure or a defense technology firm." "It is a political responsibility to know what is going on in our own backyard so we can protect our collective security," Juncker said. Europe often sends Beijing mixed messages by welcoming trade deals while criticizing China's human rights record. But last year, the EU failed to unite around a statement condemning China's crackdown on activists and dissidents. That's because Greece blocked the resolution, calling the criticism of China "unconstructive." "There's a phrase, 'pre-emptive obedience,' that's often used to discuss relations with the Chinese," says Theresa Fallon, a China analyst in Brussels. "It means making decisions with the idea of not upsetting China. That's already happening, and it's worrying if you consider the stakes. If you think of China's growth strategy [in maritime ports], they've invested all along the peripheries of Europe. So it's like an anaconda strategy: Surround it and squeeze it." Others are less alarmed but note China's power. "I think we should be aware of the fact that the Chinese are using the moment and the ability that Europe is giving China," says Arthur van Dijk, president of the Dutch Association for Transport and Logistics. "For us, it's also a wake-up call. We have to be quicker, smarter, better." "A few years ago, when COSCO first became involved in Greece, the European view was it was good because Greece was in a lot of financial difficulties and at least someone wanted to invest there," van der Putten says. "Piraeus was not a top-ranking port. People in Brussels thought it wouldn't have a lot of significance." Today, about 20 million passengers go through Piraeus each year. Since COSCO's takeover, it has become the fastest-growing port in the world, according to the industry news outlet Seatrade Maritime. 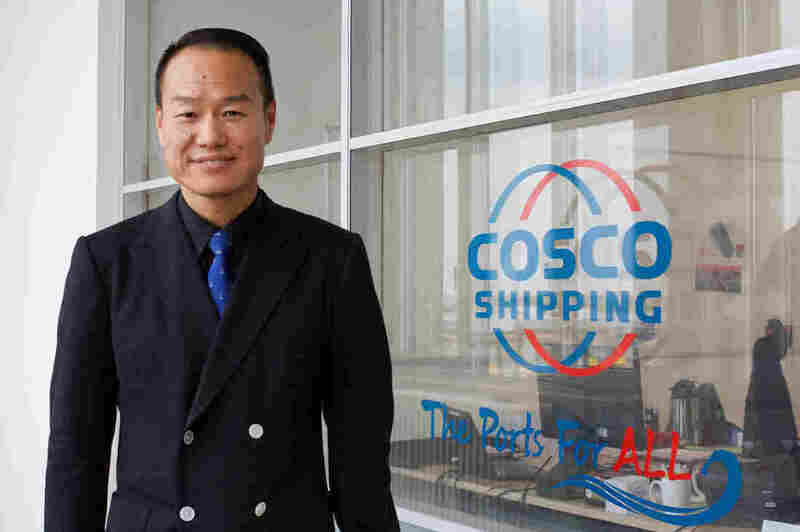 COSCO'S chief executive in Piraeus, Capt. Fu Cheng Qiu, says he wants to make it the largest in the Mediterranean. In a 2015 interview with Germany's Der Spiegel magazine, Fu attributed the company's success to hard work and said he found labor unions "superfluous" because they "promise their members more money for less work." "If you want a higher salary, you first need to work hard," he told the magazine. "Not lie on the beach and drink beer." COSCO's chief executive in Piraeus, Capt. 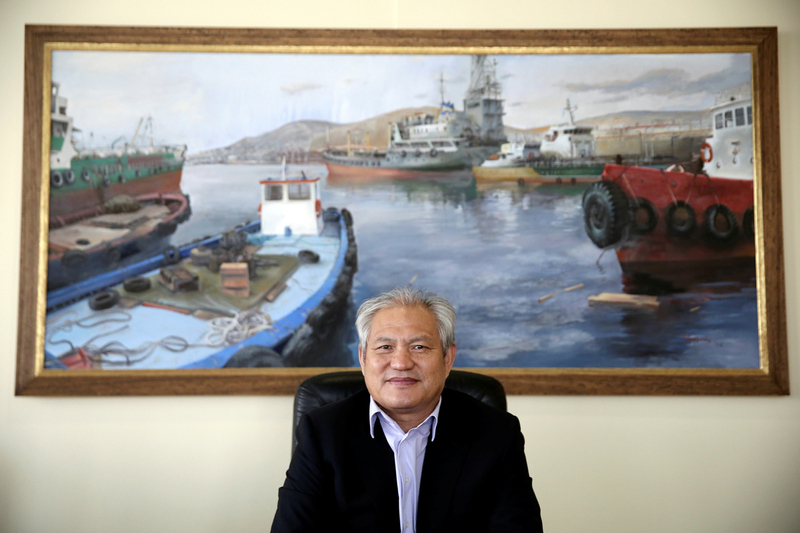 Fu Cheng Qiu, says he wants to make the port the largest in the Mediterranean. "If a European company had taken over this port, we'd be properly compensated and work under humane conditions," he says. 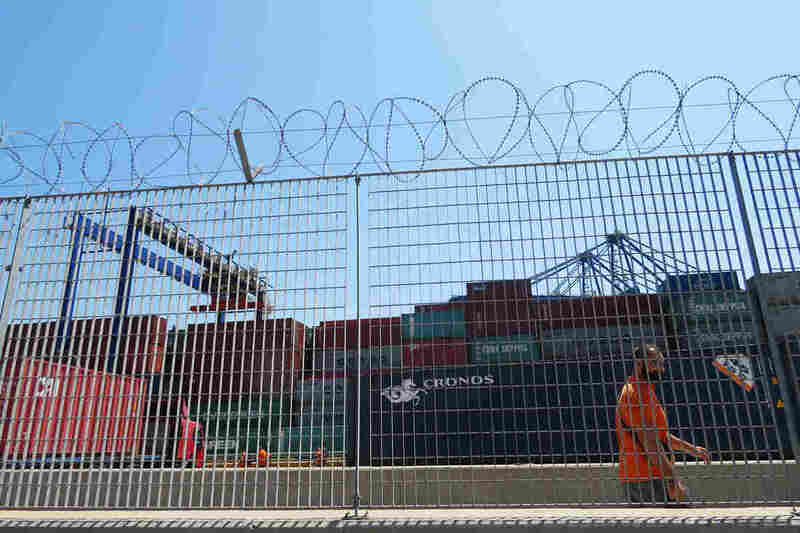 About 1,700 people are employed at the Piraeus container terminals, many working for 16 days a month, without benefits or job security, says Giorgos Gogos, general secretary of the port workers' union. They're hired by subcontractors to COSCO like Diakinisis Logistics Services, which, he says, gets a cut of money that should go to worker salaries. "This is exploitation," Gogos says. "We assume that COSCO wants to make very fast profits. So they will try to squeeze their expenses, and the incomes of workers are considered expenses. For us, these 'expenses' are our income to support our families." Another dockworker, Markos Bekris, says the situation was much worse in 2012, when he started working at the port. COSCO had taken over two container terminals and hired its own workforce. "Whenever the workers talked about unionizing, it was a red flag for COSCO," says Bekris, 30, who works at those terminals. "Those who tried to organize were fired. The workers were too scared to speak up. They kept their heads down, waiting by the phone for a last-minute call to work, sometimes working straight shifts without breaks." "My co-workers had to urinate in plastic bottles," he says. Giorgos Gogos, the general secretary of the Piraeus port workers' union, calls the treatment of employees there "exploitation." In a written statement responding to NPR's questions, a COSCO spokesman said that after a series of "long but productive negotiations" last year, a two-year labor agreement was signed "creating a peaceful environment of labor that benefits both sides." Anastasia Frantzeskaki, head of the white-collar union at the port's cruise terminal, says she and her colleagues learned one important lesson in labor negotiations with COSCO: "When the Chinese say win-win, they mean they win twice." Gogos says he's also worried that the Chinese company's tough stance toward workers could influence other employers in the area. "COSCO is now the biggest employer in Piraeus," he says. 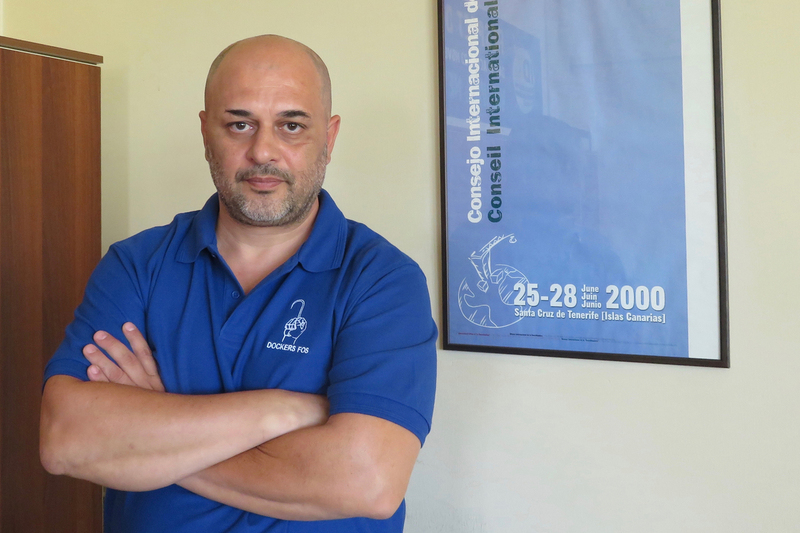 "This is a hugely strategic port that lacked investment until COSCO came along," says Christos Lampridis, general secretary of ports, port policy and maritime investments at the maritime affairs ministry. "There's new equipment, new piers, a railroad connection." "All these investments will create jobs," Lampridis says. "It's just a pity that the Greek state didn't draft a master plan itself far earlier." "A privatized port is a new situation for everybody," says Demosthenis Bakopoulos, the head of the state regulator. It's a change "for the port that was under public control, for the workers, because they were public servants and are not anymore, for the state. There are always misunderstandings, problems that demand new solutions." 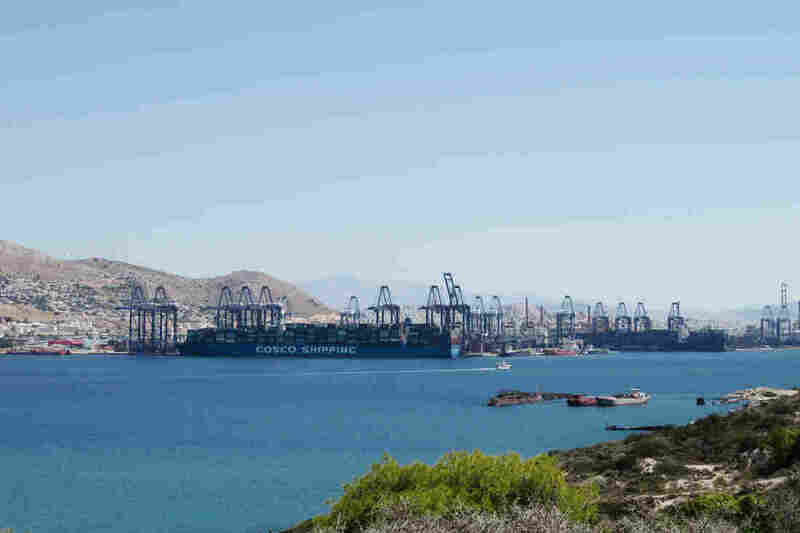 The state-owned China Ocean Shipping Co. now effectively controls the port authority in Piraeus, Greece, but Greek officials have tried to retain some oversight. Bakopoulos says such activities likely predate COSCO. "We also had smuggling before the privatization, and of course, we will have it after the privatization, because smuggling occurs in ports," he says. "There are many reasons why a country is careful about condemning another country," Kouroumblis says. "I mean, does the U.S. vote against its interests at the U.N.? So Greece also has the right to make a decision based on its own interests." The Chinese want to build on the success of Piraeus, says Olaf Merk, a shipping expert who led the OECD review of Chinese investments in ports. "The Chinese know what they want so it's all happening very fast," he says. COSCO's most recent port investment in Europe is in the North Sea harbor town of Zeebrugge in Belgium. 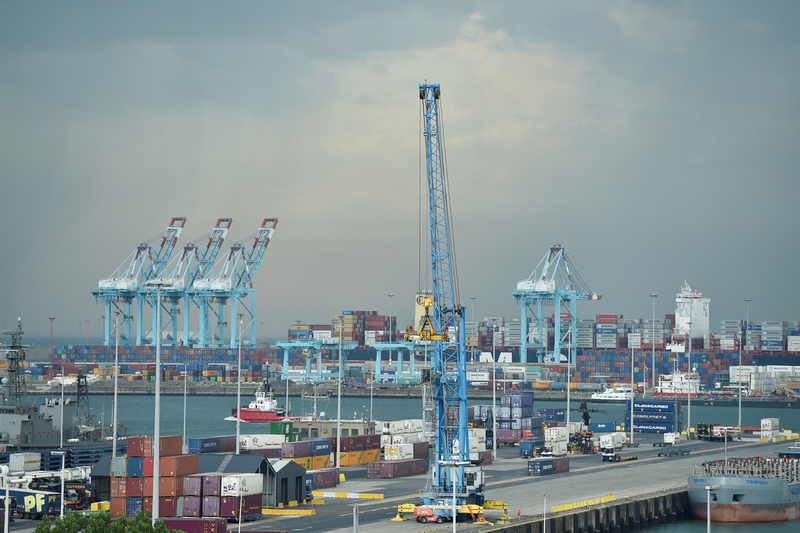 In January, the company signed a concession agreement for the container terminal in Zeebrugge, Belgium's second-largest port. COSCO's most recent port investment in Europe is in the North Sea harbor town of Zeebrugge in Belgium. Unlike Piraeus, Zeebrugge's port authority remains — by law — under Belgian control. "They are not buying the port; they are not buying shares of the port authority," says Joachim Coens, the CEO of Zeebrugge port. "They are just renting the infrastructure to do business for a certain period." David Liu, the COSCO chief executive of Zeebrugge's container terminal, says the company's Europe strategy is part of its "global ambitions." "We have big plans for Zeebrugge," says Liu, 55, a cheerful man in a navy-blue double-breasted jacket and All Star sneakers. "With this and other ports like Piraeus, we want to build a bridge to Europe." David Liu, the COSCO chief executive at the Zeebrugge port, has retained local managers at the terminal. "This is the new, open COSCO," he says. "We invest in those we work with." The unostentatious port city, a short drive from the canals and cobbled streets of Bruges, is busy with ferries, fish trawlers and automobile deliveries. But its container terminal has always been outshone by the nearby ports of Rotterdam in the Netherlands and Antwerp in Belgium, Europe's two biggest ports. For shipping companies, "it's a choice," says Carla Debart, 49, the Zeebrugge terminal's managing director. "You have to make sure that you are chosen." "There were mixed feelings with COSCO," says Debart, as she makes Chinese black mountain tea — a gift from the Chinese official leading the terminal's board of directors — in her office, which overlooks the container pier. "People could see a future again. At the same time, there was a concern with what's going to happen. Are we going to have a Chinese terminal? Is everything going to be run as a Chinese terminal?" "My biggest concern was the people," she says, referring to the 200 workers here. "So if the terminal could be a success without me, that would still be great news for the people." But to her surprise, COSCO kept her on. CEO Liu made her his deputy. "They really give us a very sophisticated and good professional team already," Liu says, beaming at Debart. "We don't want to dismantle this team. So we don't need to send all the Chinese guys from all over the world into here." Debart and other managers have taken communication classes to improve business meetings with the Chinese. Debart has also traveled to Shanghai and met the top brass. "They are proud to have Zeebrugge in their portfolio," she says. "We are just a small country, a small port, and yet they say they can learn from us. They appreciate us." Liu calls Debart "a great partner." "This is the new, open COSCO," he says. "We invest in those we work with." He notes that drawing container ship traffic to Zeebrugge is a challenge. 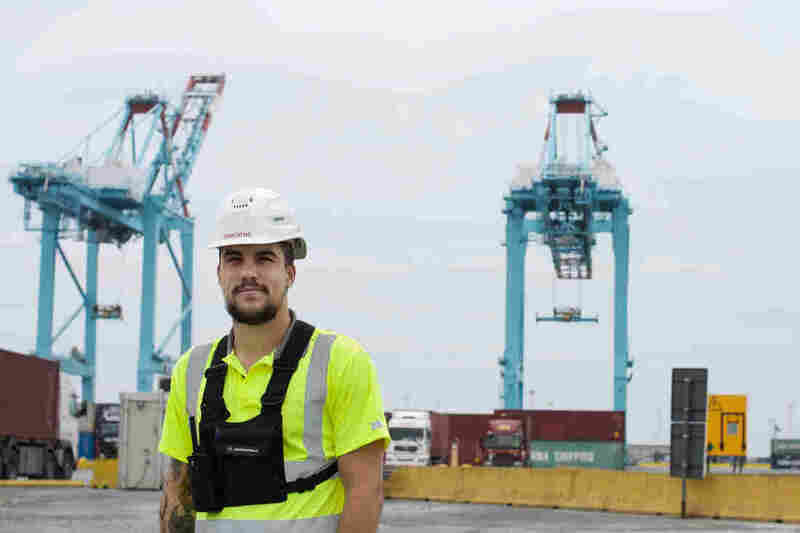 "It's a complicated job because, around us, we have bigger and stronger terminals," he says. "We need to do much, much more." Matthias Simoens, 31, is a Zeebrugge port worker who coordinates the stevedores on shift duty. He says the Chinese company COSCO has infused the port with energy and purpose. He shrugs off China's politics. "What COSCO and what Chinese companies seem to be doing at the moment is to focus money on not the largest European seaports but smaller ones and develop them to become bigger," says van der Putten, the China analyst in the Netherlands. Zeebrugge has always wanted to be bigger. "This is the best opportunity for us," says Matthias Simoens, a 31-year-old port worker who coordinates the stevedores on shift duty. Simoens drives around the site, passing enormous cargo-lifting machines called straddle carriers — which the crew call "elephants." Workers operate these "elephants" to move metal containers marked with "COSCO" and "CHINA SHIPPING" onto ships. He says COSCO has infused the port with energy and purpose. He shrugs off China's politics. "The most important thing to me is that I have a job," he says firmly. It's unclear how widespread this feeling is. Simoens tries to explain their reticence. "They have heard bad rumors about COSCO," he says, that the Chinese would break the unions and the laborers would end up working in developing world conditions. "I say we give COSCO a chance." "It's always been ups and downs here," he says. "Always good plans, but it never really took off. But I think now we're really taking off." Reporters Rosanne Kropman and Maria Sidiropoulou contributed reporting in Zeebrugge, Belgium, and Piraeus, Greece. A previous version of this story misspelled one of Fu Cheng Qiu's names as Qui.